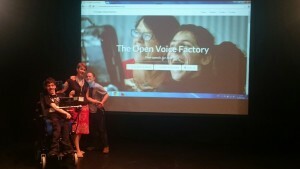 Today eQuality Time released The Open Voice Factory to public beta. The Open Voice Factory is a free, open source tool for creating communication apps. Anyone can create an aid by editing a PowerPoint template to add their one pages or utterances. When you upload your template to the factory, it will create a working communication aid for you. The website lets you play with our demos, have a go at creating your own, and find out how you can help. We’ve produced a set of YouTube videos covering the basics of editing. We’ve added the first one below.